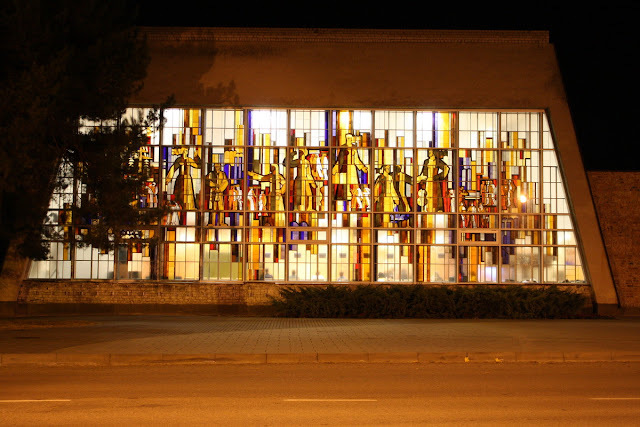 This beautiful Stained Glass piece "Lithuania" by Vytautas Švarlys that decorates the Culture Centre of Birštonas is one of the largest stained glasses in Lithuania. The stained glass "Gintarinė Lietuvos šviesa" (Amber Light of Lithuania), created in 1980, has been for a long time called "The Soviet Lithuania" because of the Soviet ideology prevalence, although the author claimed that there were no Soviet symbols and signs in it. After the restoration works in 2001, the title of the stained glass was shortened and now it bears the title "Lithuania". The stained glass depicts the historical period of Lithuania, from the Grand Duke of Lithuania Mindaugas and Vytautas the Great to the fights for the freedom of Lithuania, achievements in art, culture, and science. One big surface of the stained glass portrays a historic period with a variety of colors, each time capturing viewers’ attention with new lights and shades during festivals and other events. The stained glass has been registered in the Register of Cultural Properties under unique code 15340. That's all for now! May your day be filled with sunshine!